Keratea is a pretty town in Eastern Attica that lies 41 km south-east of Athens, at the slopes of Panion mountain. It is known for its very good wine and olive-oil that are produced from vines grown in the Attica climate and vast olive groves. There is also a bee keeping activity in the area. The history of Keratea begins between 700-500 BC, based upon findings in the area such as the "KOUROS OF KERATEA" which was found in 1893. Keratea's brilliancy and thriving are evidenced from ancient times. The town originates in the ancient municipality of KEFALI, which was one of the one hundred municipalities of the ten tribes created by Cleisthenes in 507 BC. The name, according to the most popular interpretation, comes from the tree "KERATIA" or "Locust-Tree", which existed in large land stretches around the town. The town has remarkable natural sceneries most of which are by the sea. There are resorts with many holiday makers, such as "KAKI THALASSA", "DASKALIO", "VGETHI", "VROMOPOUSI", where someone can find friendly beaches and beautiful Greek taverns. There are many (old) chapels and country churches as well as small and large monasteries. The visitor who chooses to spend his holidays in the sea-side settlements or visit the town, should take care to visit the cave of "PAN", where in ancient times Pan, Apollo and the nymphs where worshipped. Its is in this caves unnumbered chambers that Lord Byron lost his way in 1810. The archaeological findings that have emerged in the broader Keratea area are numerous and include Amphorae�s of the Geometrical Era, inscriptions, grave plates of the Classic Period, whole male statues like the "KOUROS OF KERATEA" (550 BC), the "Aristodikos Attikos Kouros" (550 BC) and still another Kouros (now in New York). A distinguished archaic female statue of the "GODDESS OF KERATEA" (in Berlin) (580 - 560 BC), has also been found which is exhibited outside Greece in the State Museum of Berlin. An ancient theatre in the region of Thorikon is of outmost archaeological importance, built in the 5th century BC and is perhaps the first theatre in Greece, in better words in all of Europe, since the ancient Greeks were the first who created theatre, at least in Europe. 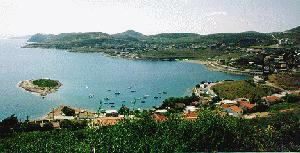 The association "Chrisi Tomi" was founded in 1975 in Keratea of Attica. The intention of its founders was to contribute to the intellectual development of Keratea supporting the fine art and litterature and at the same time bring the social faculty of the town into action so that every day problems would be dealt with collectively and with a sense of responsibility. In its 22 years of activity �Chrisi Tomi� has produced about 350 appearances (lectures, discussions, music festivals, exhibitions, theatrical plays, movie shows, dances, excursions and other more). Top-ranking modern Greek writers and poets like Antonis Samarakis, Spiros Plaskovitis, Dim. Fotiadis, Eli Alexiou, Dido Sotiriou, M. Koumantareas, Andr. Fragias, Iak. Kampanelis, Nik. Rotas, T. Patrikios and others have been invited by �Chrisi Tomi�. Leading modern Greek composers like M. Loizos, G. Spanos, Th. Mikroutsikos, L. Kelaidonis, Chr. Leontis, N. Mavroudis, L. Kokotos, Il. Andriopoulos, N. Tokas have presented their work. The association has also published books, calendars, photographic albums of Keratea and the periodical �Chrisi Tomi� for almost a decade. It has founded a public library, and a meeting-place and members of the association started the formation of the Gymnastic Club of Keratea in 1984.
whilst its interventions in matters of local problems, especially environmental protection, have been in most cases productive and efficient. Today �Chrisi Tomi� keeps a meeting-place together with office, refreshment room and library in Keratea�s Main Square (55, Athinon - Souniou - Tel. +30299 - 69 850). The members of the board of �Chrisi Tomi� for this initiative are: G. Krikellis, G. Iatrou, A. Moraitis, S. Papathanasiou, A. Giasemi. There also is a theatrical group that is accommodated in our association. This page has been visited times so far. This page was translated and layed out by Eurolang Translations.